Marinform AS introduced the idea of a 25,000 DWT chemical tanker designed for operating at lower design speed, with a lower block coefficient and halved ballast requirement. To convince their customers of the benefit of such a vessel, they needed a partner who could first validate their co ncept and later optimize the hull design. SSPA was chosen and could provide independent expertise at each step of the hull development: early power estimation, hull form optimization and finally, tank testing. Marinform AS in Norway and StoGda in Poland have developed a new type of 25,000 DWT chemical tanker. Marinform AS, the originator of the design concept, introduced the idea of a hull designed for operating at a lower design speed, with a lower block coefficient and halved ballast requirement. Together with StoGda, lead designer for the construction work, they decided to thoroughly investigate the potential of their concept, first with an early evaluation of the design, then through a complete optimization, with freedom to modify the main dimensions of the hull. The complete operational profile was to be considered during the whole study . SSPA, as one of the major players in tank testing over the past 75 years, was first commissioned to provide an independent estimation of the power demand of such a vessel, thus achieving confidence in the project among the different players and financers. This laid the ground for a sensitivity analysis which indicated that despite the promising conclusions of the study, further power saving could be achieved by refining the main dimensions. During this phase of the project, the full operative profile was in focus. Alternative designs were compared using empirical formulae based on statistics from SSPA’s large test database. A complete route over the Atlantic was considered, using realistic weather and loading conditions. The hull presenting the lower fuel consumption over the complete voyage was selected. This method allowed studying, very cost-effectively, a large variation of parameters and propulsion configuration, thus acting at an early stage on the parameters that most influence oil consumption. 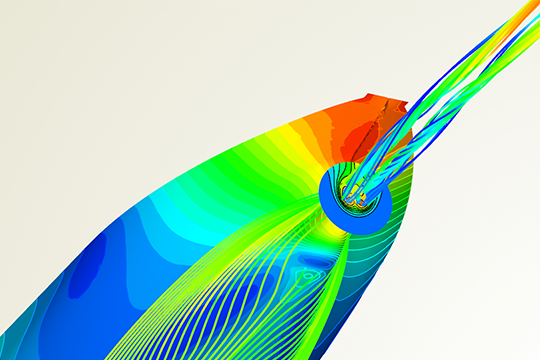 To further refine the power predictions while evaluating up to hundreds of hull variants, a hull development based on CFD (Computational Fluid Dynamics) computations using SHIPLFLOW® was undertaken. Experience from tank measurements combined with expertise in computational hydrodynamics is the key to a broad approach during the hull optimization process. Visualization of the flow predicted by CFD around the aft body of the optimized 25,000 DWT chemical tanker. The resulting design was thereafter subjected to thorough model testing at various loading conditions. Model testing is part of an array of tools that are all necessary for understanding the design as a whole, and at the same time it is the foundation on which statistics and CFD can rely to constantly improve their accuracy. illustrated by their EEDI (Energy Efficiency Design Index) achieved respectively. Data at the required EEDI draught (often scantling) is unfortunately not always available. It was therefore decided to compute all indices at design draught for each of the vessels. It is reasonable to assume that the conclusions taken from this comparison are valid at scantling draught as well. The figure below shows the relative position of each vessel to the different EEDI reference lines. The achieved index for the hull developed in collaboration with Marinform/StoGda lies in the vicinity of the EEDI value that will come into force in 2020. Of course, this is to be considered with some reservation, as the index is evaluated for design loading conditions, disregarding other systems on board. 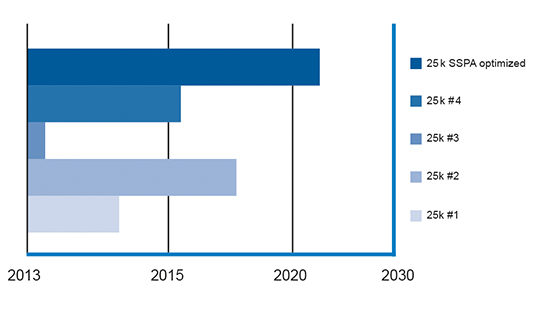 Estimation of EEDI for five 25,000 DWT chemical tankers, in relation to the four implementation phases of the rule. However, the trends are very promising, and the study confirmed the positive effect of the optimization on the power demand. This in turn, and together with a design speed lower than average, allowed for a lower installed power on-board, reducing the EEDI index drastically. The EEDI index does not reflect the full performance of the vessel, as it focuses on a single loading condition and a single speed. Other speeds may of course be of interest and for a tanker, ballast draft should also be considered. The current vessel presents a very light ballast displacement, estimated to be 10% lower than the average in the world fleet. Consequently the hull presents an extremely low wetted surface at this draft. This, together with the very good characteristics already described for design draft, led to a power demand exceeding expectations. The combination of expertise in various domains of hydrodynamics such as model testing, CFD, and sea-keeping, together with a rich history of model testing and thus a large database of hull forms, make SSPA a unique partner in the hull development process. Customers have already acknowledged this high-level expertise and the project described above illustrates how, through close collaboration, the new challenges of the industry can be met. superior performance. The picture above shows streamlines on the hull surface for the 25,000 DWT chemical tanker. SSPA participated at the International Conference “Influence of EEDI on Ship Design” arranged by RINA. The paper presented was “Improving the EEDI of a ship – There’s many ways to solve an equation”.